Today I did a mini triathlon. It started with a car oil change at a new location. I walked home from the place. Realized I’d dropped my driver’s license (Panic!) somewhere when I pulled my iPhone from my pocket to mark how far I’d be walking, and put it back in, and pulled it back out. Got on my bicycle and (Hurray!) found my license in the parking lot of the new oil change place. But I’ve only listed two of my triathlon sports: walking, then cycling. What could make my third event? I’d considered swimming in the lake across the street, but that required too much work to change out of my clothes, into a swimsuit, out of a wet swimsuit, and back into clothes. Instead, I decided to mow our needy lawn. I’d only gotten the side and back yards done when dripping sweat stung my eyes too much to continue. Went back into the house where I had to change, anyway, out of my soaking shirt and underwear. 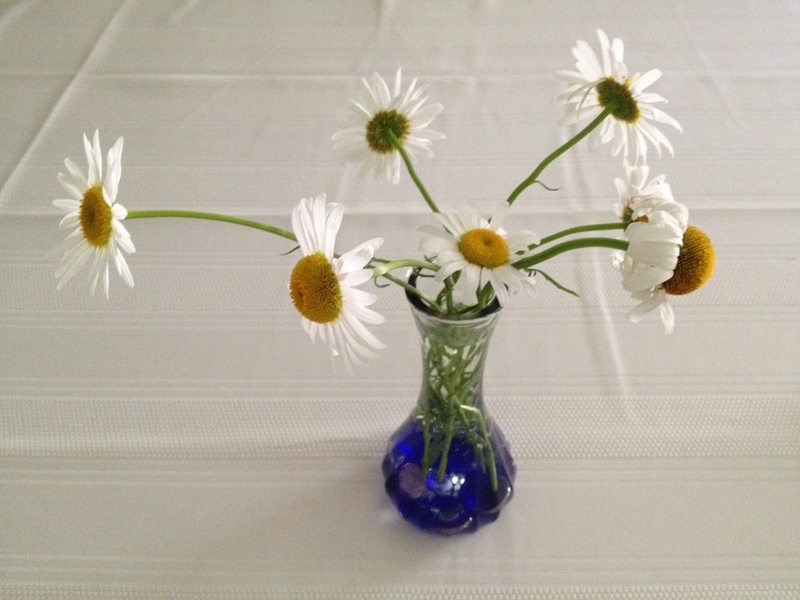 I’d accidentally mowed down some wild shasta daisies, so got my reward from competing my walk-cycle-mow mini triathlon with some daisies sitting pretty in a vase on our table. May you, too, have mini triathlons throughout your summer. This entry was tagged mowing lawn, summer activities for writers. Bookmark the permalink. Now that’s a new kind of triathalon to me, but I say go for it. You are very creative. Ha. Thanks. Looking around for more and different activities for more triathlons.